CintaNotes lets you quickly save and tag any useful information that you come across or just need to jot down. Clip text from anywhere. Just select it and press the hotkey! The text-clipping “magic” works in any application that can copy text to clipboard. CintaNotes automatically saves the text and its source URL, and you don’t even have to install a plug-in to integrate it with your web browser! Retrieving information is also trivial: just open CintaNotes and start typing! Only notes containing the typed phrase remain in the list. More sophisticated search criteria are supported, like searching by title or by URL the note was taken from. You can use tags for note organization, and later use tag union, intersection and subtraction filters to quickly find what you need. Using the Simplenote synchronization feature in the PRO version of CintaNotes, you can get full read/write access to your notes on any iOS, Android or Windows Phone device. Live note synchronization is supported with the help of free online services such as Google Drive, DropBox, or SugarSync. CintaNotes is a totally self-contained application, meaning that you can put it on a flash drive and run it directly from there. In this way, your notes will always be with you. During installation, there is an option (check box) to “Create a desktop icon”. When this box is checked, the installation program does NOT, repeat NOT, create a desktop icon. Of course, there is a work-around by going into “Programs” and doing a “Send To Desktop” to create a shortcut. Why doesn’t the installation option work in the first place? Not very “Pro” to me! Thanks for reporting this. Could you please tell what is your exact Windows version? Thanks! This is probably one of the best offers on SoS for a long time. Honestly, if you’re into note-taking, knowledge management, keeping tabs on various projects, or browsing the web to collect information, take advantage of this, you won’t regret it. 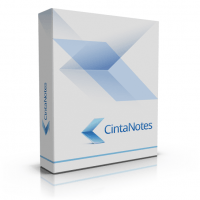 I’ve been using Cinta Notes for ten months now, mainly to gather information online and file it for subsequent use, and it’s one of the cleverest pieces of software I’ve ever owned. It makes it exceedingly easy and fast to clip information from any page with a text content — especially a web page. With a single hotkey combination, you create a note, populate it with the selected text, and automatically append to it its title, URL, date of collection, and even automatic tags following your own custom rules. Editing the note further is a breeze. There’s a remarks field to give context to the note. Rich text can be dragged and dropped into the note, and it will retain any hyperlinks that were in the original text — this is especially useful for people who need to build knowledge databases out of the Internet. Of course, you can create a note as a blank slate, then type or paste your own text into it. Searching your notes is extremely fast and efficient. It’s based on a powerful combination of tags, tabs and notebooks. The main filing tool is hierarchical tags, which combine the advantages of tags and nested folders. Those are displayed on the left-side panel, instead of the folder tree Windows Explorer, or other note-taking applications, usually put there. Then there is a wider level of classification, with as many tabs as you want, spread across the top of the screen. And finally, you can group your notes in as many notebooks as you like, and switch instantly from one to another. Searching into those databases is orders of magnitude more efficient than searching files on your PC, or bookmarks in your browser. Scraping information from the Web to file into Cinta Notes, then using Cinta Notes search tools at some later point, is a much safer bet than relying on Internet search engines, which might or might not retrieve, several months from now, a Web page you once came across. The program’s design philosophy is based on guessing users’ intentions, doing what they want fast, and not getting in the way. This is in marked contrast with many note-taking apps, which take center stage, and throw everything at you but the kitchen sink. Cinta Notes correctly assumes that note-taking is a secondary activity — very important in its own right, obviously, but occurring as a corollary to whatever you’re doing at the present time. By showing itself less, it actually does more. Bear in mind that this is a rich text-centered application. You cannot paste an image into a note. However, you can paste a link to an image on the Web or on your PC, or attach an image file to a note. This is a very acceptable workaround, as long as your work is not centered on graphics. A certain degree of cloud synchronisation is provided, but there are limits to it. If syncing several devices is central to your needs, there might be better suited products for you. Regardless of the present offer, Cinta Notes has a free version which is already very powerful in its own right. However, here you get the Pro version, which has some extra functions you wouldn’t want to do without once you’ve grown accustomed to them. Also, at 39 $, the Pro version is rather on the high side of the price scale for similar programs, which makes the SoS deal all the more attractive. Cinta Notes is actively developed and has a small, but resourceful forum. Thanks for a great review, Clairvaux! Greatly appreciated! While we are using PC, a lot ideas come to our mind but we forget them quickly. Moreover, there are a lot of things that you might need to remember which could be something related to work or something else. The solution to not forget ideas and important stuff is writing them down as soon as they come to your mind. CintaNotes is a small software application designed specifically to deal with this issue. It lets you quickly save and tag any useful information that you come across or just need to jot down. CintaNotes is an amazing tool that works both online and offline, allowing the users to create and manage personal notes, such as to-do lists, ideas and article fragments. The user interface of the application is simple and easy to get used to. The application works two modes, namely portable mode and installed mode. Adding a new note is very simple, and the key shortcuts to most actions provide ease of use to the users. It is also suitable for multitaskers or people who want to access two different notes at a go, as it allows to manage multiple notes at the same time. This tool works in both installed mode and portable mode. Portable mode is perfect for carrying it around in a USB flah drive and using it anywhere. Key shortcuts further reduce the time between idea or a thought coming to your mind and you taking a note of it. These shortcuts feel like a blessing once you get used to this tool. Search feature is speedy and comes in handy when you’re seaching through a lot of notes. With synchronization feature you can get full read/write access to your notes on any iOS, Android or Windows Phone device. Either for back up or for sharing purposes. Including images or any other attachments is not possible. MAC OSX support would be great and that would really make the synchronization useful. CintaNotes is a nice tool that can be quite useful on a daily basis. Especially for those who have to remember a lot of thing at work and home or for people like me who get a lot of ideas but forget them quickly. With this software, you will never lose your precious ideas any more. The intuitive layout makes it easy to use for even novices. It is definitely worth trying out. Thanks a lot for a favorable review! One small remark though: note attachements _are_ supported in the PRO version, which is exactly what you get with this promo! Cintanotes is an amazing window based notes tool that will work in both portable and installed mode. Combining this with the fact that it works both online and offline and you get something that will put your note taking game at the very front. It is a perfect replacement to the window’s sticky notes option and the fact that you can synchronize it between devices makes it an utter convenience. Since all the notes pop up into a different window, you can manage multiple notes at a go making it a perfect tool for multitaskers or people who want to access two different notes at a go. Cintanotes draws its strength from its simplicity and practicality. It might not have all the features you need to create comprehensive notes but it has all it takes to keep your thoughts flowing in the perfect way. Thanks a lot for the review, Dennis! Again, why do you say that attachments are not supported? You can attach any file to a note by opening it and clicking on the paperclip icon in the upper right corner (or alternatively press F12). This works only in the PRO version though.